Equipment being collected in the operating rooms for recycling includes laparoscopic devices, arthroscopic/orthopaedic devices and energy devices like these examples. Emory University Hospital Midtown (EUHM) and Emory University Hospital (EUH) are going green, thanks to a new comprehensive waste management plan. The hospitals are on a mission to reduce and divert waste by implementing a new recycling program in the operating rooms (ORs) and other patient care areas. Emory Healthcare, which includes seven hospitals, and Emory University have a combined goal of diverting landfill waste by 65 percent across all of Emory by 2015 through sophisticated recycling and composting programs. 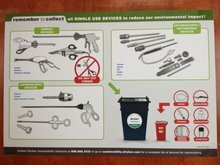 Emory University Hospital Midtown kicked off the recycling program in May, and Emory University Hospital is just beginning its new recycling efforts. "Operating rooms create a tremendous volume of waste," says Jane Duggan, MD, assistant professor of anesthesiology, and lead of the OR Green Team at EUHM. "Much of it is clean waste and can be recycled. Health care sustainability is critical, and by diverting waste from landfills, we expect to take huge strides forward in greening our campus." More than ever, hospital leaders are prioritizing and implementing sustainable practices to minimize their environmental footprint. A conservative estimate from Practice Greenhealth, the premier US organization for healthcare sustainability, is that hospitals in the US produce almost 6 billion tons of waste annually, or 33 pounds per bed per day. To reduce this waste, the hospitals are aligning with several companies to make this mission a success. Medical technology company Stryker has placed bins in every operating room to collect used medical equipment. Equipment being collected includes laparoscopic devices, arthroscopic/orthopaedic devices (at EUHM) and energy devices. Those devices will be taken to a facility in Florida for recycling. Stericycle, a medical and hazardous waste company, will collect all clean plastic containers, clean plastic wrap, and clean cardboard boxes, many of which package surgical and sterile medical equipment, for recycling. Stericycle has also partnered with EUHM's Environmental Services team to collect recyclable plastic, aluminum, glass, and paper from common spaces such as waiting rooms, lobbies and administrative spaces. Educational efforts on what to recycle and what to place in regulated medical waste bins are ongoing. "We have been busy training and orienting the operating room staff, nursing staff, hospital departments and our physicians about the new waste management program," says Toni Wimby, associate administrator at Emory University Hospital Midtown. "This new program will be a team effort for all involved and we are excited to have it up and running." "Emory is committed to upholding healthy communities for its patients, staff and the residents of Atlanta through its initiatives to reduce waste, energy and water consumption across the system," says Catherine Maloney, associate administrator at Emory University Hospital. Since 2007, Emory Healthcare has partnered with MedShare, an international, non-profit organization that sends surplus medical supplies to underserved hospitals and clinics. Emory Healthcare donates unused, unexpired supplies to MedShare, as well as equipment that is no longer in use. Emory Healthcare collected 159,000 pounds of supplies for MedShare in 2012 alone. "Recycling and reducing medical waste protects public health by reducing emissions from methane - a potent greenhouse gas - and exposure to other toxins such as dioxins and heavy metals," says Kelly Weisinger, program coordinator for Emory's Office of Sustainability Initiatives. "Emory Healthcare's efforts are not only reducing the industry's impacts on public health and the environment, but are promoting financial stewardship of Emory's resources." Emory Johns Creek Hospital is working with Stryker to collect used surgical equipment for recycling. At Emory Saint Joseph's Hospital, medical waste reduction is accomplished with the help of a machine called a Chem Clav, which sterilizes and converts medical waste to landfill waste. Emory Saint Joseph's Hospital is the only hospital within the Emory Healthcare system to have its own waste conversion system on site. This technology has been used at the hospital for 18 years. Also of note, Emory University Hospital Midtown and Emory University Hospital have joined the Healthier Hospitals Initiative's Less Waste Challenge, a challenge to reduce regulated medical waste, increase recycling rates and increase construction and demolition waste recycling. These two hospitals join dozens of others across the country to "green" their operations. Healthier Hospitals Initiatives is a program developed out of collaboration between 12 of the nation's largest and most influential health systems and Health Care Without Harm, the Center for Health Design and Practice Greenhealth.